International Geophysical Year Stamp is a piece of digital artwork by Robert Grubbs which was uploaded on April 27th, 2018. 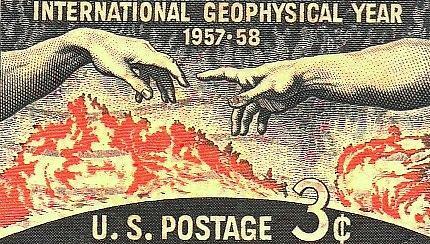 The International Geophysical Year (IGY; French: Année géophysique internationale) was an international scientific project that lasted from July 1, 1957, to December 31, 1958. It marked the end of a long period during the Cold War when scientific interchange between East and West had been seriously interrupted. Joseph Stalin's death in 1953 opened the way for this new era of collaboration. Sixty-seven countries participated in IGY projects, although one notable exception was the mainland People's Republic of China, which was protesting against the participation of the Republic of China (Taiwan). East and West agreed to nominate the Belgian Marcel Nicolet as secretary general of the associated international organization. The IGY encompassed eleven Earth sciences: aurora and airglow, cosmic rays, geomagnetism, gravity, ionospheric physics, longitude and latitude determinations (precision mapping), meteorology, oceanography, seismology, and solar activity. The timing of IGY was particularly suited to some of these phenomena, since it covered the peak of solar cycle 19. Both the Soviet Union and the U.S. launched artificial satellites for this event; the Soviet Union's Sputnik 1, launched on October 4, 1957, was the first successful artificial satellite. Other significant achievements of the IGY included the discovery of the Van Allen radiation belts by Explorer 1 and the defining of mid-ocean submarine ridges, an important confirmation of plate tectonics. Also detected was the rare occurrence of hard solar corpuscular radiation that could be highly dangerous for manned space flight. The International Geophysical Year traces its origins to the International Polar Years, which had been held in 1882–1883 and 1932–1933 (and would be held again in 2007–2009). In March 1950, several top scientists (including Lloyd Berkner, Sydney Chapman, S. Fred Singer, and Harry Vestine), met in James Van Allen's living room and suggested that the time was ripe to have a worldwide Geophysical Year instead of a Polar Year, especially considering recent advances in rocketry, radar, and computing. Berkner and Chapman proposed to the International Council of Scientific Unions that an International Geophysical Year (IGY) be planned for 1957–58, coinciding with an approaching period of maximum solar activity, and in 1952 this was announced. Thanks Nicola. I appreciate it! Thanks for honoring my work in your group. I appreciate the acknowledgement. Thanks Todd. I'm trying something different with this one.